Ultra-convenient and economical, the E-Series rectangular picnic tables aid in maximizing an overall experience and enjoyment of outdoor spaces. Developed from a classic outdoor table design, these 6' and 8' tables feature perforated or diamond pattern surfaces supported by a MIG welded steel tube frame. The strong, open table design construction with 30" wide table top and 10" wide seats offers superior load bearing abilities and hassle free maintenance, easily wiping clean and quick to dry. 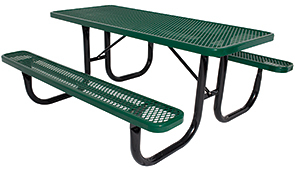 Combining top-of-the-line weather and vandal resistant finishes with commercial grade steel allows theses 6' and 8' E-Series picnic tables to be a cost-effective way for facilities to expand outdoor seating. ►Need a Picnic Table Fast?